1. Finally, the poignant situation of millions of people, who dont have the means, to even provide in their most basic needs. After having read the previous steps, it will be clear to everyone, that the flow system could play an important role here. Isnt it a system for optimizing basic functions after all, cheap, comprehensible, simple and effective? It not only gives a clear insight in what is needed and possible on basic levels, but it also corresponds to ideas of people of other cultures. Unlike the imposed Western models - cultural, social, economic, religious, medical - the flow system is very similar to models of Traditional Medicine all over the world, e.g. Indigenous, Ayurvedic, Chinese, Arabic and European. Hence, the flow system fits very well in local situations, without imposing something alien from outside. On the contrary, once incorporated, it will support the peoples own strive for cultural, social and economic self-reliance and self-determination. The need for the quality of life" isnt a Western privilege after all. Poor people of the slums have a very clear idea of optimizing their situation. Many of them remember the past, in which they had a life of prosperity, co-operation and happiness. Their deepest desire is to restore their cultural, religious, social, economic and ecological integrity. 2. The example of how the Free World Health Care works is the cooperation with local organic farming initiatives. The optimal fertility of the soil is a precondition not only for the regeneration of the soil itself and high quality crops, less pesticides and pollution, the self-reliance of the local community and a contribution to nature conservation, but also for achieving optimal health. Therefore the fertility of the soil and organic agriculture are the cornerstones of our approach. Through our training program the farming community is able to connect its activities with optimizing the health situation of its members. 3. For this purpose, I have initiated the WorldNetWorkFund Foundation. The basic idea is to raise funds to make the FreeWHC available to the poor, wherever it is needed. In my lectures for colored people (Caribbean), Asian people (Chinese), Arab people (UAE), black people (Ghanese), people of the slums (favela, Brazil) etc., I was surprised about the reception of the flow system. Very simple" people could easily understand the logic, they accepted it with great enthusiasm as their" model, very suitable for peoples health" as they saw it. They had a great sense of the possibilities of Self Care and natural ways of healing! 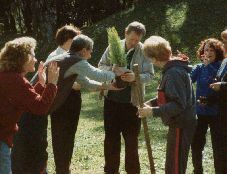 My lectures included nutrition, self-help techniques, medicinal herbs, personal hygiene and the environment, a basic package of provisions, necessary for survival and improving ones health. Hence, everybody should have unlimited access to the FreeWHC. For instance, the poor have the right to equal access to organic wholesome food. According to us the minimal health requirements for the poor is enough water and land on which people can grow their own staplefoods, like potatoes, rice, manioc, tapioca and pumpkin, their cereals like corn, millet, buckwheat and quinoa, their fresh vegetables, their beans and soybeans. Every local community should strive for organic quality with the help of green legumes, compost and other organic material. 4. Another example of how the program of the FreeWHC can be called in is our cooperation with nature conservation organizations. For one of the (major) problems in protecting a natural reserve is the attitude of the local people living next to it. The success of protecting endangered species largely depends on cooperation with surrounding communities. How to gain the active cooperation with locals is a task conservation organizations often encounter. The FreeWHC with its health and ecology centered approach can be a great introduction to take up with the interests of the locals. In return for optimizing their health, together with greater understanding of ecology and its value, these people will be more willing to cooperate with the principles and practice of nature conservation. 5. Based on the flow system, the Free World Health Care offers concrete non-profit help to poor countries through support of local initiatives, women's groups, non-governmental health and environmental organizations, governments and e.g. universities. To educate Basic Health Consultants is one of the cornerstones. The aim is educating people in self and mutual help, helping the community to become healthy, including agriculture as well as the environment, while simultaneously working on a New Health Care system. This consists of the three layers of Self Care, Holistic (Traditional) Medicine and Technological Medicine respectively. Because of its low costs and the use of local resources, it is the solution not only for us here in the West - think of the excessive increase of costs every year - but especially also for poor countries. 6. Its health-oriented approach is dearly needed in situations where illness is largely caused by the lack of basic provisions like healthy wholesome food. The FreeWHC's flexibility makes it possible to adjust to every local culture and community. The flow system is an advanced scientific model, which simultaneously supports traditional views on health, integrating local roots with the benefits of modernization. Its structure shows unity in diversity". Wherever you come, you will recognize the common factor, while enjoying the local difference. Details, some therapies, diets or exercises may be changed, but its inner dynamics will prove to be universal". By giving it the local color, it may support the restauration of spiritual, cultural and social identity of various peoples worldwide. It is therefore the wish of the founder, that people from different cultures may sit together, to discuss in what way the flow system, the workbook and the training could be useful to them. will prove to be a powerful partner in achieving the objective. Knowing from experience that projects led by women are among the most sustainable, we are giving priority to women's initiatives. 8. Every effort has to be made to further development of health care worldwide, all initiatives are therefore to be supported. However, everything will prove to be in vain, if not referred to a scientific, practical and effective health oriented medical model. Only if people are given a useful instrument, with which they can have a positive feedback, in such a way that they feel acknowledged, encouraged, motivated and empowered, only then there will be a way out of the current stagnation. Personal experience and a meaningful context have to go hand in hand, so that people will find (regain) the strength to take their health - as they see it - in their own hands". A peoples health movement is what is needed. The FreeWHC is giving people such a model. We are open to further suggestions!